Causes of AKI where urine sodium concentration and fractional excretion of sodium may be initially reduced, only to later increase. In these conditions, the GFR is reduced because of activation of systemic and/or intrakidney vasoconstrictors causing a reduction in filtered load of sodium at a time when tubular function is relatively intact. As the insult persists, tubular injury becomes more widespread, resulting in an increase in urine sodium concentration and fractional excretion of sodium. Urine chemistry profile in metabolic alkalosis. (A) Loop and thiazide diuretics and their genetic equivalent (Bartter and Gitelman syndrome, respectively) cause contraction of effective circulatory volume and activation of the renin-angiotensin-aldosterone axis. Increased distal delivery of sodium coupled with increased mineralocorticoid levels causes increased potassium secretion and an increased rate of hydrogen ion secretion in the distal nephron, leading to the development of hypokalemic metabolic alkalosis (27). The fractional excretion (FE) of urea is reduced to <35% because proximal reabsorption of urea is stimulated and unaffected by the downstream impairment in sodium chloride transport. Metabolic alkalosis due to remote use of diuretics is sensitive to chloride-containing solutions but resistant in genetic disorders. (B) Antibiotics such as carbenicillin, ticarcillin, and piperacillin given in the setting of decreased effective volume act as nonreabsorbable anions, causing increased delivery of sodium to the distal nephron, resulting in development of hypokalemia and a chloride-responsive from of metabolic alkalosis. The urine pH (UpH) in this setting is acidic because of augmented hydrogen ion secretion. (C) Active vomiting or nasogastric suction generates a chloride-sensitive form of metabolic alkalosis. Bicarbonate acts as a nonreabsorbable anion, causing increased distal sodium delivery and development of potassium wasting (29). (D) A primary increase in mineralocorticoid levels (Conn syndrome) or effect (Liddle syndrome) leads to a chloride resistant form of metabolic alkalosis accompanied by kidney potassium wasting and hypertension. Increased distal delivery of sodium is due to inhibition of proximal reabsorption brought about by effective volume expansion. The urine chloride concentration can be used to distinguish between a chloride responsive and resistant metabolic alkalosis. In a normal gap metabolic acidosis due to diarrhea, a high urine chloride is the result of increased excretion of NH4Cl. Urine chloride is high in kidney tubular acidosis due to acidosis-induced decreased reabsorption of NaCl in the proximal tubule. In the indicated causes of anion gap metabolic acidosis, a high urine chloride is the result of increased excretion of NH4Cl. In these settings, the urine sodium is typically higher than the chloride due to the excretion of sodium and potassium acid salts. 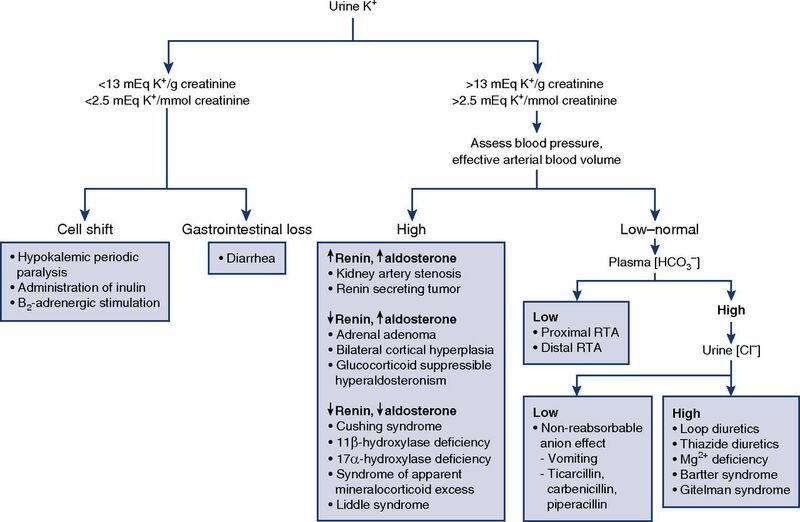 A flow diagram for the approach to patients with hypokalemia on the basis of the potassium-to-creatinine ratio in the urine. RTA, renal tubular acidosis. Urine chemistry profile in metabolic acidosis of kidney and nonkidney origin. (A) In diarrhea, stool loss of potential bicarbonate, sodium chloride, and potassium lead to a normal gap hyperchloremic metabolic acidosis, hypokalemia, and extracellular fluid volume contraction. Acidemia and hypokalemia stimulate kidney ammoniagenesis allowing for increased amounts of distal hydrogen ion secretion to occur. Ammonium is excreted coupled to chloride, accounting for the development of a negative urinary anion gap and increased osmolal gap. The urine pH (UpH) is not maximally acidic despite robust distal hydrogen ion secretion because the free hydrogen ion concentration is reduced due to the buffering effect of urinary ammonium. (B) Shown are various examples of overproduction aciduria. The excretion of the sodium or potassium salts of these acids (NaA) into the urine represent the indirect loss of bicarbonate from the body and cause the urine anion gap to remain positive despite large amounts of ammonium excretion. Urine sodium and potassium concentration will be greater than the urine chloride concentration because chloride is retained in response to volume contraction. Although some ammonium is excreted as NH4Cl, a large amount of ammonium is excreted coupled to the anion salts of the acids. The urine osmolal gap is increased due to the large amount of ammonium in the urine indicating the acidosis is of extrakidney origin. (C) Distal (type 1) and proximal (type 2) renal tubular acidosis (RTA) are characterized by hypokalemic hyperchloremic normal anion gap metabolic acidosis. Distal (type 1) RTA results from defects in hydrogen ion secretion in the distal nephron interfering with bicarbonate regeneration. 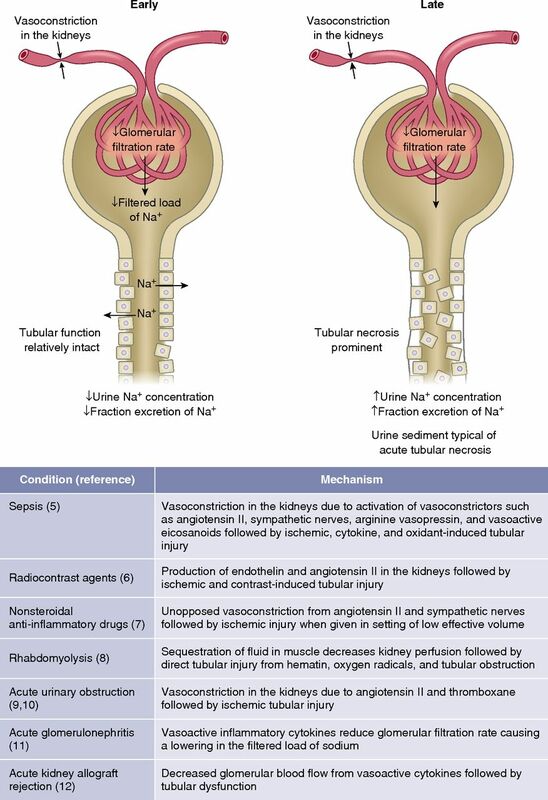 The urine pH is always alkaline (pH 6–7) and urine potassium is increased due to coupling of increased distal sodium delivery with increased aldosterone resulting from acidosis-induced decreased sodium reabsorption in the proximal tubule (36). Impairment in activity of the H+-K+-ATPase can also contribute to kidney K+ wasting. Proximal (type 2) RTA is the result of impaired bicarbonate reclamation in the proximal tubule due to a decrease in the tubular maximum for reabsorption. When the plasma bicarbonate exceeds the tubular maximum, the urine pH will be alkaline and urine sodium and potassium will be increased whereas urine chloride is low . Once the plasma bicarbonate concentration falls to the reduced tubular maximum, the urine pH will become acidic and the degree of potassium wasting will decrease. 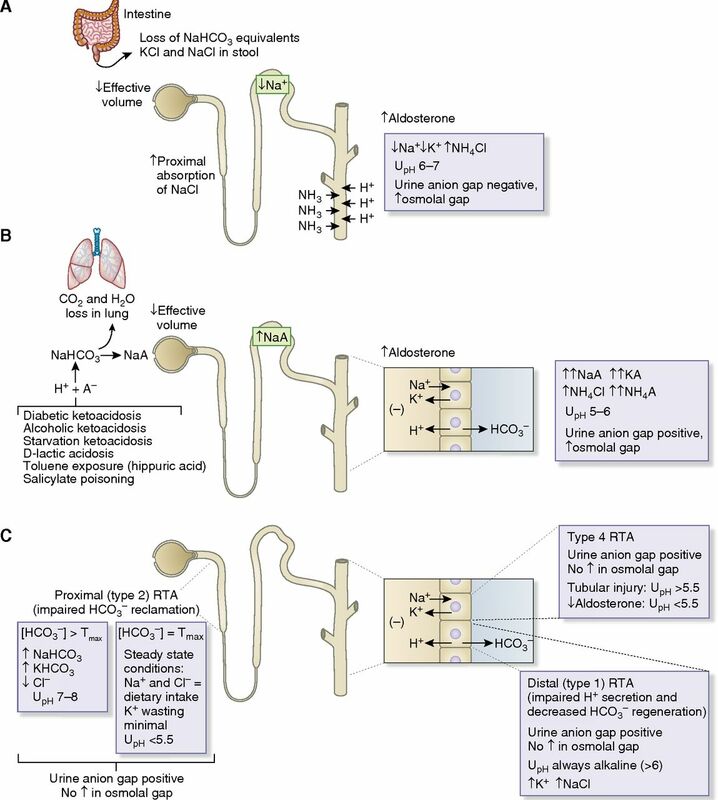 Type 4 RTA is characterized by hyperkalemic normal anion gap metabolic acidosis. When the disorder results from a disturbance in the renin-angiotensin-aldosterone axis, the urine pH is acidic, whereas when it results from tubular dysfunction, the urine pH is more alkaline. In all types of RTA, urine ammonium excretion is reduced, reflected by a positive urine anion gap and no increase in the urine osmolal gap. Urine chemistry tests for the diagnostic evaluation of a patient with polyuria. Polyuria is generally said to be present when urine output is >3 L/d and can be due to either a water diuresis or an osmotic diuresis. A urine osmolality (Uosm) <100 mOsm/kg indicates a water diuresis. Restricting free water intake will cause a decrease in urine volume and an increase in urine osmolality in psychogenic polydipsia, whereas no effect is seen in diabetes insipidus. An increase in urine osmolality after the administration of desmopressin is found in central diabetes insipidus whereas no response is found in the nephrogenic form. A urine osmolality >300 mOsm/kg is observed in osmotic diuresis. Values between 100 and 300 mOsm/kg favor a mixed polyuria as with simultaneous water and solute intake or partial central or nephrogenic diabetes insipidus. Patients with CKD are unable to maximally dilute the urine and can also fall within this range when challenged with a water load. Administration of NaCl is responsible when the majority of osmoles can be accounted for by two times the sum of Na+ and K+ concentration in the urine. An osmotic diuresis due either to glucose, urea, or mannitol is present when there is a large gap between the urine osmolality and the urine electrolyte concentration. 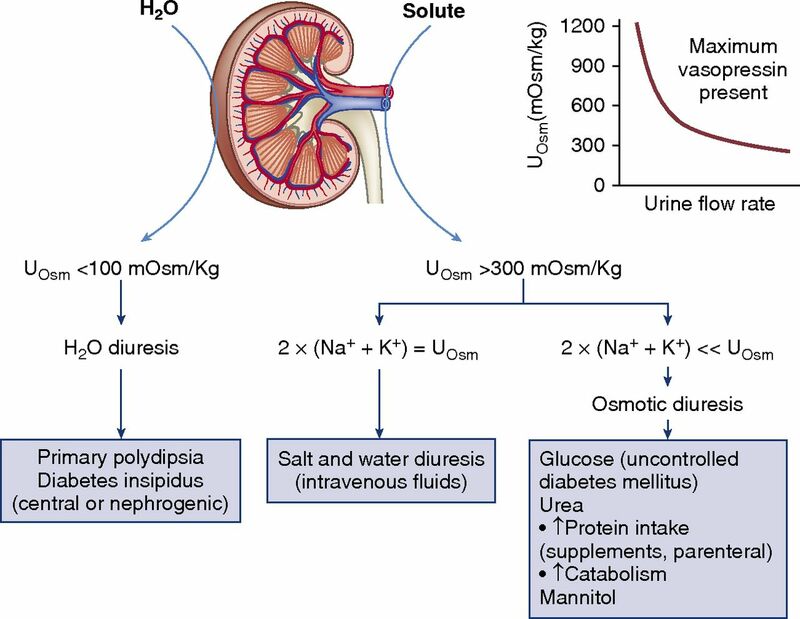 Even though urine osmolality is often greater than plasma values, hypernatremia can develop during an osmotic diuresis because the plasma Na+ concentration is determined by the relative loss of water and electrolytes and not total solutes. Calculation of electrolyte free water excretion predicts the change in plasma Na+ concentration in this setting. The graph demonstrates that with progressive osmotic diuresis the urine osmolality will progressively decrease to values that are isosmolar with plasma because high tubular flow rates prevent osmotic equilibrium with medullary interstitial fluid even when arginine vasopressin is not limiting (44).